With the latest iPod Touch—Generation 6!— Apple’s iOS runt gets a better camera and powerful guts, which make it feel like a baby iPhone that doesn’t make calls. But why would you buy it if you already have an iPhone? An iPod Touch, which looks identical to the last. But despite its tiny dimensions and lamentable screen, the 2015 iPod Touch’s guts have been upgraded. It’s got a beefy A8 processor, including the M8 motion coprocessor for activity tracking. It also sports an 8-megapixel camera, which is the same resolution as the iPhone 6’s sensor. The base 16GB model costs $200. For most normal humans, an iPod—Touch or otherwise—stops making sense the second you get a smartphone. It’s been that way for years, and yet the iPod Touch remains, a slightly outmoded relic people give their kids until they’re old enough to have phones. The iPod Touch’s beefed up specs, however, look impressive enough to make the iPod something a regular person might use as, for example, a Wi-Fi enabled camera with easy access to email and Instagram. Moreover, with the power boost, the iPod has the potential to be that third device that consumers crave. What if instead of screwing around on a tablet when you’re sitting on the couch, you screw around on the iPod that lives in your living room? Then again, as the iPod becomes more and more like a smartphone, it sort of makes you wonder why you would want a slightly underpowered smartphone that won’t make calls. It looks pretty much identical to the last iPod Touch. Except now it comes in gold, too! (I went with blue, obviously.) It’s got a four-inch display and weighs just 3.1 ounces. I won’t bore you with a whole walkthrough of the device. It runs iOS 8, and of course, it plays music and has apps. The overall experience is a bit like using a tiny iPhone, except of course, the iPod doesn’t have cell service. The screen really feels a lot smaller than even the 4.7-inch display on the regular iPhone 6. The flipside here is that it’s light enough to carry around without even noticing it. The graphics performance is solid but not quite up to snuff with good smartphones. The new guts are fast, and even bigger games load without any problems. Which is to say: You can play games on the new iPod Touch. You could watch movies on it, too. I wouldn’t really want to. It’s comparatively small and low-resolution if you’ve upgraded your phone in the last few years. For this reason it’s not really a suitable replacement for a tablet, either. As for the new camera, it’s not the beast we’d hoped. Earlier this week Michael Hession put the camera through our usual battery of tests, and the iPod Touch came up short compared to the latest generation iPhones on everything from detail to color to low-light performance. The iPod’s camera performs more like camera on the iPhone 5S. That’s totally respectable, but hardly cutting-edge. This is the first iPod that can track your activity natively, making it a totally suitable running companion. It’s way lighter than smartphones and you don’t have to worry about dropping it during your run. Your running info is tracked in Apple’s Health app, and syncs up with the activity you log with other devices. The screen is really small by contemporary standards, which makes it hard to do things like read and watch videos. This is the best iPod Apple’s ever made—good enough that it’s easy to forget it’s not a phone at times. But it’s not a phone, and if you already have a smartphone, it’s hard to justify buying another gadget that replicates its functionality without giving you something else. There are plenty of niche scenarios in which the iPod Touch might be useful. The most convincing use is as a spendy exercise accessory. I could see it as a small, cheap connected device to leave on your coffee table, or maybe a compact travel tool. But do you have a use for it that wouldn’t be satisfied with, uh, an iPad mini or something? 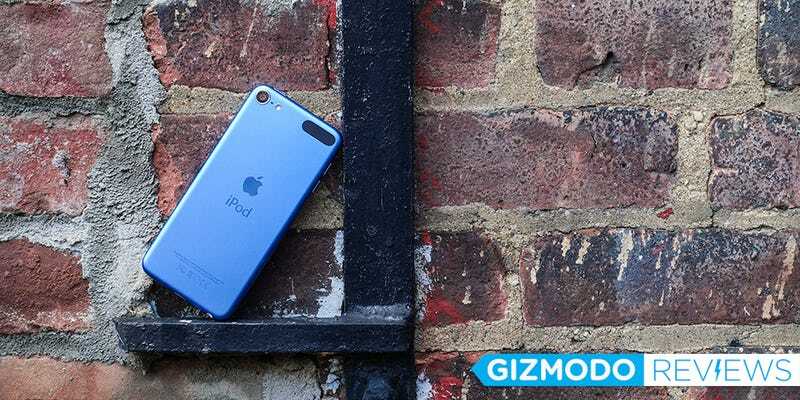 There’s nothing wrong with the new iPod—it’s totally fun. It just feels like a toy. You know, for children.